Arkansas head football coach Chad Morris added nearly 30 years of SEC experience to his coaching staff when he announced the hiring of John Chavis as the program’s defensive coordinator January 9, 2018. Chavis spent the last 23 years as a defensive coordinator at Tennessee (1995-2008), LSU (2009-14) and Texas A&M (2015-17). 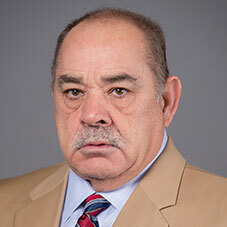 The 2011 winner of the Broyles Award as the top assistant coach in college football, Chavis has been part of 21 bowl games, 12 10-win seasons and appeared in the SEC Championship game six times over his 23 years as a defensive coordinator in the SEC. Chavis, who has 29 years of experience in the rugged SEC, has produced a defense that has ranked among the top four in the league in total defense 15 times during his 23 seasons as a coordinator. During his time at Texas A&M as associate head coach and defensive coordinator, the Aggies were one of five FBS programs (Alabama, Clemson, Penn State & Washington) to rank in the top 25 in sacks each season from 2015-17, highlighted by an SEC-best 43 this past fall. A key contributor to those sack totals was Myles Garrett, who led the SEC in sacks in 2015, and was a unanimous first-team All-American in 2016 en route to being the No. 1 overall pick in the 2017 NFL Draft by the Cleveland Browns. Prior to his three seasons at Texas A&M, Chavis was a key piece to a successful six-year run at LSU that saw the Tiger defense finish in the top 15 nationally in total defense five times (2010, 2011, 2012, 2013, 2014). During Chavis’ tenure in Baton Rouge, the Tigers forced 152 turnovers and accounted for 14 touchdowns and two safeties. In 79 total games, Chavis’ defenses held the opponent under 100 yards rushing 32 times. LSU had its best year under Chavis in 2011, as the Tigers capped the year ranked in the top five in the nation in four categories including total defense (No. 2 at 261.5), scoring defense (No. 2 at 11.29), pass efficiency defense (No. 3 with 95.58 rating) and rushing defense (No. 5 at 90.1). LSU also ranked No. 8 nationally in pass defense with 171.43 yards allowed per game. LSU’s 2011 defense featured a young and explosive defensive front along with arguably the nation’s top secondary with two national award winners in Tyrann Mathieu and Morris Claiborne. LSU allowed only six first-half touchdowns, including just two in the first quarter all season, as the Tigers rode their dominant defense’s style of play to a 13-0 regular season mark, the SEC title and a spot in the BCS National Championship Game. In both 2010 and 2011, Chavis and the Tigers defense featured the Thorpe Award winner (nation’s top defensive back) in Patrick Peterson in 2010 and Claiborne in 2011, as well as the Bednarik Award winner (nation’s top defender) in Peterson and Mathieu in 2011. LSU was also home to the SEC Defensive Player of the Year in Peterson (2010), Mathieu (2011 by AP) and Claiborne (2011 by Coaches). Over Chavis’ six years at LSU, the Tigers and Alabama were the only two SEC programs to rank in the league’s top four in scoring defense every year from 2009-14. LSU finished in the top 12 nationally in scoring defense five of six years under Chavis, highlighted by No. 2 and No. 4 in 2011 and 2014, respectively. The Tigers led the SEC in passing defense twice (2010, 2014) in his six years while they led the league in total defense his final season in 2014. Prior to his arrival in Baton Rouge in 2009, Chavis spent 14 seasons as the defensive coordinator at Tennessee, helping the Vols win at least nine games in a season 11 times. The Vols reached the 10-win mark eight times during his time as defensive coordinator, which included a school-record 13 victories during their national championship season in 1998. The Vols had 11 wins in 1995, 1997 and 2001, and they won 10 games in 1996, 2003, 2004 and 2007. With Chavis as the defensive coordinator, Tennessee made five appearances in the SEC Championship game, winning the league title in 1997 and 1998, and it was invited to three BCS bowl games. Behind a recruiting belief that there is no substitute for speed and an aggressive defensive philosophy, Chavis has coached and mentored 70 NFL Draft picks, including 15 first rounders, during his time as a defensive coordinator in the SEC. Chavis has seen one of his defensive standouts taken in 22 straight NFL Drafts as a defensive coordinator and 26 consecutive years dating back to his time as the defensive line/linebackers coach at Tennessee. Out of the 70 players selected, 42 have been taken in the top three rounds. Over a run of eight NFL Drafts from 2006-13, Chavis saw eight players taken in the first round with at least one going in seven of them. In 2013, LSU became the first school in NFL Draft history to have six defensive players selected during the first three rounds. LSU finished with eight defenders selected in the 2013 NFL Draft, including the second straight year with a pair of first rounders. In all, Chavis has coached 81 players taken in the NFL Draft during his time as a defensive coordinator or from his position room as an assistant coach. Over his 29 years in the SEC, he has seen a player taken in 27 of a possible 28 drafts. Chavis, who is originally from Dillon, South Carolina, is married to the former Diane Crisp. They are the parents of sons, John and Jason. He graduated from Tennessee in 1978, as a three-year letterwinner at middle guard for head coach Johnny Majors.